While in Atlanta for the Master’s Conference, Jodi Ann and I had the great opportunity to have lunch with High Priest Bruce Croucher, his wife Sharon and Michael Martin, National Grange Membership/Leadership Director. While having lunch Brother Croucher asked the question “how do you take someone from being a member to being a Granger?” WOW, what a question! Is there a difference? Aren’t all of our members Grangers? Fast forward to early April; Jodi Ann and I hosted a brainstorming session with Steve and Claire Logan (RI), Michael Martin (National Grange), and Carmen Brickner (Consultant). 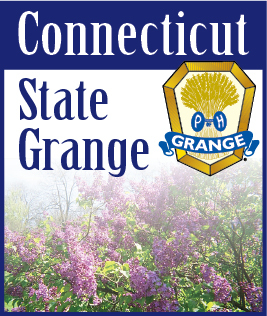 (We are exploring the potential opportunities for expanding the Grange into non-rural communities.) During this brainstorming session Carmen asked if we only “welcome” people into membership or do we create a “belonging” environment. Holy COW that is the same question Brother Croucher asked. Now this REALLY got me thinking, what type of image do we offer to our guests and new members, sorry, new GRANGERS? Are we creating an atmosphere that fosters individual growth and achievement? Do we encourage ALL of our members to be engaged in our discussions or developing programs? When we hold a meeting or activity do have meaningful work for all? Do we treat our members as Grangers? We need to always be asking ourselves do we have members in our Granges, or do we have Grangers? There is no secret; our numbers are not as strong as they were just 10 years ago, and by making sure we are continually seeking out new Grangers, making sure there is meaningful work for all, making sure we are cultivating a belonging atmosphere, we will quickly exceed our Grange Growth goals. When we are working on the same team, with the same focus, with the same pride of being not just a Grange member, but a PROUD GRANGER, it is then that we will truly be a Grange that is influential in the lives of everyone in our Grange and community. Please ask yourself, am I a member or a Granger? You might be surprised by your answer.